Everyone knows what to do in case of a fire – get out and call 911. Not everyone knows what to do after the fire is out. Here are a few Do’s and Don’ts for getting through the aftermath of a fire. – Don’t reenter your home until it’s been inspected and approved for reentry by a professional. It’s impossible to know if a structure is stable just by looking at it and unstable floors can collapse with even just a little extra weight. You also want to make sure any hot spots are completely cold. – Don’t touch anything with your bare hands. Oils from your hands can cause further damage to fragile walls, upholstery and woodwork. – Don’t wash the walls Using the wrong products and/or technique can compound the soot and make things even worse. – Don’t try to clean carpets or upholstered furniture Commercially available products and equipment aren’t up to this type of job. – Don’t use electrical appliances until they’ve been checked by an electrician. Don’t use any ceiling fixtures in rooms where the ceiling shows signs of water damage. – Don’t eat or drink anything that was left in the home. They may be contaminated with particles or residue. The heat from the fire may have compromised seals on cans, and the refrigerator and freezer probably aren’t working. – If the outside temperature is above 60 degrees, open doors and windows to let out the smoke and air out the building. – Clean plastic, chrome, porcelain, and aluminum fixtures to prevent tarnishing and etching. – Change furnace and air conditioner filters. They’re full of smoke and soot, the last things you want circulating through your home. – Place damp cheesecloth over return and supply vents and registers to catch loose particles in the air before they can get into the filters. If a fire unexpectedly damages your home, handling the clean-up could mean the difference between a small inconvenience or something much, much worse. Learn the dos and don’ts with this helpful video. 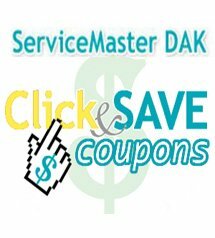 If you experience a fire at your home or business in the North Shore or Northwest Chicagoland suburbs, call the professionals at ServiceMaster DAK. We’re available 24/7 to respond quickly to fires to mitigate the damage and help you get things back to normal as quickly as possible. Restoration costs vary, depending on the extent of the damage.